it was the best homemade cheesecake with nice,creamy and also with firm texture. 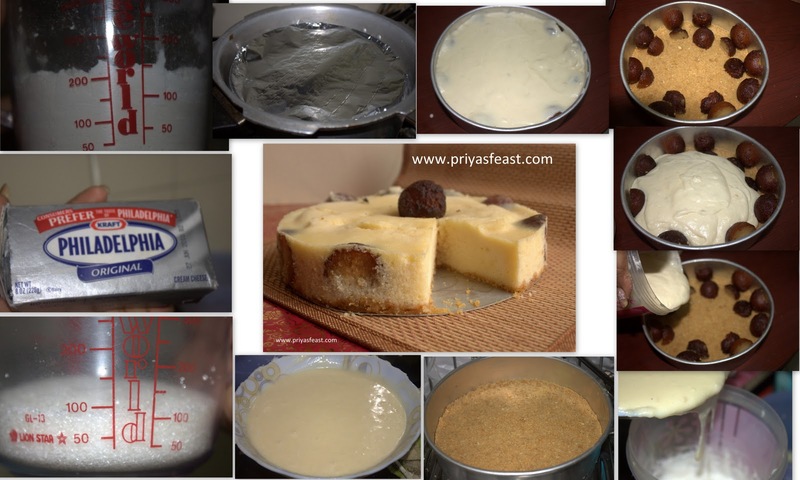 Check the stepwise pictures in clockwise direction..
12.Dont over bake it,since it will turn hard. 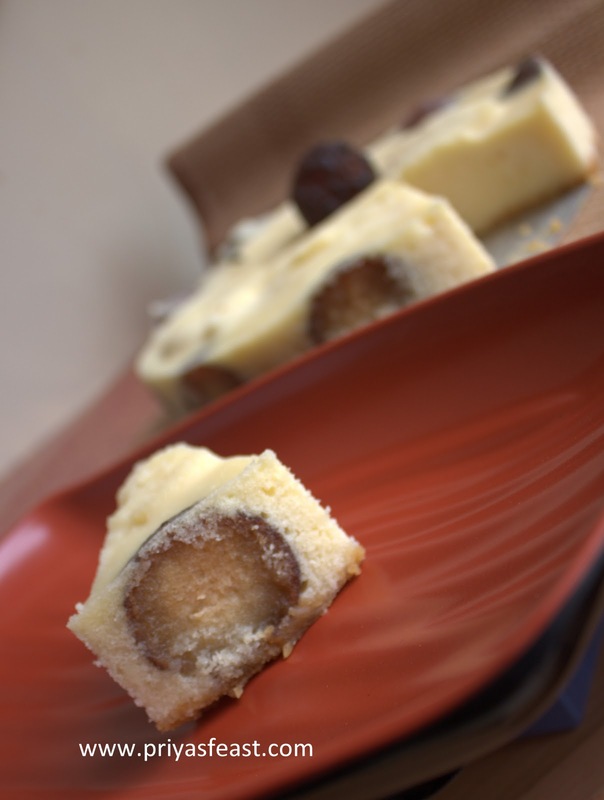 Once baked,Refrigerate for 2-3 hours and Serve Chilled...Those who use condensed milk,reduce the Sugar amount. Superb recipe...so innovative and classy..I am bookmarking this. Kudos to you for such a wonderful innovation. Awesome recipe dear..Would give it a try ! 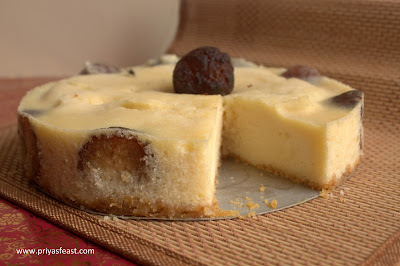 Havent heard or had this cheesecake,jamun in cheesecake looks absolutely awesome and terrific..
Stunnig cheesecake..I have tried jamun in an icecream but this is new & interesting!! woww adding jamuns in cake is very interesting,it looks so spongy!!yumm.. Lovely cheese cake, I still have to try my hand on it. Wowwwwwwwww.... very delicious and unique recipe.. looks so tempting.. thanks for the wonderful recipe dear.. Yummy !! wow, lovely spongy soft cake !! seriously drooling here .....absolutely love this one...amazing dear.. I have never tried cheese cake till now. I think time has come now. Nice cake and helpful stepwise pictures. Slurp,finger licking cake.. wat a idea love it. I bookmarked this one as soon as I saw the name. Two of my fav desserts in one dish sounds incredible, looks awesome!! Jamun and cake together Priya??? Wow, this is so creative and love the look of the outcome. Beautiful cake and so moist! Am not a big fan of cheese cake, but your version attracts me very much! :) Nice recipe priya! OMG ~ this is seriously a masterpiece, perfectly executed n so well presented!Kudos! The PHILADELPHIA CREAM CHEESE is something I will get here in Goa. If I do get it the price will be something that i will have fit at. So can you tell me abt a sub for this. Cottage cheese? Oh man! This is truly amazing. Looks awesome! @Archana,U can make with lil soured hung Curd,which is the best sub.I saw Cream cheese is available in amul brand which is also less affordable. This is an extraordinary dessert,we loved it.Thank you so much for sharing.God Bless You!! Lovely jamum cheesecake!! Very innovative too! Thanks for your lovely comment on my blog! wow , its looking yummy..new to me..
Lovely delightful new jamun cake. This sounds and looks so yum. What an interesting cheese cake! This is such an innovative recipe. Loved it. Hats off to you! Truly an awesome rich cake.